Save Money on Produce… and Get Healthier Too! It’s my favorite time of year! Not just because the weather is finally warming up but because it is time for the Environmental Working Group’s annual release of the Dirty Dozen and the Clean 15 fruits and vegetables. As we turn the corner, (finally!) toward Spring, it’s a perfect time to talk about choosing the fruits and vegetables and the tradeoffs between your health and your finances. As a result of the diminished nutrient profiles in foods due to modern farming practices, we need to eat more fruits and vegetables than ever. You may remember a prior article in which I shared research that to get the same level of nutrients from two peaches eaten back in the 1950’s, today you’d have to eat 53! We are all trying to make our money in this tough economy stretch as far as it can, so it’s good to know that there is some produce that you can buy conventionally grown; being able to purchase it at your regular store or when it’s on sale means you can really save some money. Other fruits and vegetables, however, absolutely should be bought organic, as it’s worth every penny of the investment in your health to avoid the toxic pesticides they contain. Every year, the Environmental Working Group, or EWG, releases a list of the 12 most contaminated fruits and vegetables known as The Dirty Dozen. They also provide a list of the Clean 15 that you can feel safe about buying conventionally grown. The list changes every year as some dirty produce does get cleaned up and some clean produce begins to show signs of pesticides. Everything not on one of these two lists is a use-your-best-judgment call: buy organic if and when you can, especially if it’s something you don’t peel. The more important avoiding pesticides is to you, the more items on the “in- between list” (meaning anything not found on either of the two lists that follows below), you’ll probably want to look for organic. 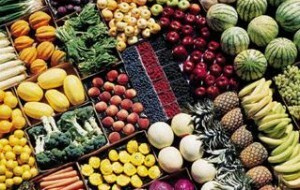 If it’s not a big priority for you at the moment vs. other health considerations, if you don’t have growing children, if you cannot afford it or it’s not a regular purchase, it’s ok to consume the conventional produce on the “in-between list” periodically as long as you wash it well or don’t eat the skin. 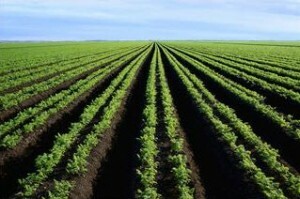 To the extent that you can, buy local and support your small farms whenever possible especially if buying conventional; the further food travels, the more it will be sprayed to ensure it makes the journey without spoiling and the less time it’s allowed to ripen and reach nutritional maturity. It’s important to note that most genetically modified produce such as corn and soy is used to make packaged goods and doesn’t end up in the produce aisle. Some produce will be labeled with a sticker that begins with the number 8, which indicates it’s genetically modified and should always be avoided, but it’s not a requirement and so most produce will not have such clear markings. More and more stores are adding organic produce; these are the fruits and veggies to look for wherever you shop and make it a rule to invest in organic versions. Trader Joes is pretty good at stocking these if you have access to one nearby, but even there, it’s hit or miss. There are many times of the year I cannot get organic apples for my kids’ lunches and so we have to switch to something else until they come in because I will not buy conventional. Also try visiting local farms or farmers markets and talking to the farmers. Many smaller farms follow organic farming practices but cannot afford the time and expense of applying for organic certification. Again, even if not certified organic, local produce will have more nutrients and is a better choice than heavily sprayed conventional produce that travels from far away. Finally, last year, the Dirty Dozen list had some additions that didn’t meet the full criteria but were commonly found to have toxic pesticide contamination. This year, two vegetables made their “plus” list: hot peppers and leafy greens such as kale and collards. These vegetables show pesticide residues of organochloride pesticides that are toxic to the nervous system and as a result have been phased out of agriculture. They make the list because residues still linger in farm fields and have been found on conventional produce sold in stores, so these should also be purchased as organic. Last year, domestically grown summer squash such as yellow crookneck squash and zucchini made the plus list too. But this year they have removed it from the highest level of danger list, finding pesticide levels to have improved. As produce season gets under way, enjoy the 9-13 servings per days of fruits and vegetables your body requires for optimal health, but invest in the best form you can of the dirty dozen and you can save some pennies on the rest! As a result of the diminishment of the nutrient profiles in foods due to modern farming practices, we need to eat more fruits and vegetables than ever. You may remember a prior article in which I shared research that to get the same level of nutrients from two peaches eaten back in the 1950′s, today you’d have to eat 53! It’s important to note that most genetically modified produce such as corn and soy is used to make packaged goods and doesn’t end up in the produce aisle. Some produce will be labeled with a sticker that begins with the number 9, which indicates it’s genetically modified and should always be avoided, but it’s not a requirement and so most produce will not. More and more stores are adding organic produce; these are the fruits and veggies to look for wherever you shop and make it a rule to invest in organic versions. Trader Joe’s is pretty good at stocking these if you have access to one nearby, but even there, it’s hit or miss. There are many times of the year I cannot get organic apples for my kids’ lunches and so we have to switch to something else until they come in because I will not buy conventional. Finally, last year, the Dirty Dozen list had some additions that didn’t meet the full criteria but were commonly found to have toxic pesticide contamination. This year, two new vegetables made their “plus” list: domestically grown summer squash such as yellow crookneck squash and zucchini, and leafy greens such as kale and collards. Every year, the Environmental Working Group tests fruits and vegetables to determine which are the most — and least — contaminated with pesticides. If you’ve been a subscriber from the beginning, I have shared the previous results with you. But the list can and does change over time and as we find ourselves in the height of summer here in New England, with fresh produce all around, I want to share the 2012 results to help you make better fruit and vegetable choices. Let’s start with the good news! The following made the Clean 15 list, which means they were the cleanest and least pesticide-laden of the crops. This list is important because if you are watching your pennies and trying to determine when you can afford to buy — or whether you should splurge on — organic produce, these items can typically be purchased conventionally grown and still be ok to eat. While local is always better since the nutrient levels will be higher because they are fresher from farm to table, you can still pick these up in any market and not worry about spending the extra money on organic. One important note, however. Corn in this country is very often genetically modified, and not usually labeled as such in stores. So if you are concerned about consuming GMOs as I am, then buying organic corn is essential. Now for the worst offenders. These are the most pesticide-ridden fruits and vegetables on the market, and some of them contain as many as 57 different pesticide residues. When you are looking to buy any of these for your family, this is when you should definitely consider splurging on organic versions. It is important to note that many of these are staples in growing kids’ diets, so reducing the amount of pesticide exposure by buying organic is an investment in future health well worth making. Thankfully, Trader Joe’s keeps us stocked on the organic apples, strawberries, potatoes and grapes my kids rely on. Hopefully, you can find organic versions nearby in Trader Joe’s, Whole Foods or at your local market. If not, ask your local farmers how they raise their produce. Many small farms follow organic practices but have not gone through time consuming (and expensive for a small farm) practice of becoming certified as organic. Ask the farmers at your local farmer’s market about their practices: farmers following organic practices will be excited to tell you about it. In 2012, the Dirty Dozen also included a special category, citing two crops that didn’t make the top twelve offenders but posed other health concerns. These vegetables, green beans and leafy greens such as kale and collard greens, were commonly found to be contaminated with a highly toxic organophosphate insecticide that has been shown to be toxic to the nervous system. While the insecticide is not used frequently any more, it has not been banned, so it is still allowed on food crops and green beans and leafy greens were often found to contain this pesticide. For this reason, these items should always be purchased organic. And always wash your produce, whether it is conventional or organic. Soaking in a citrus veggie wash or a bath of baking soda and a little vinegar will help remove residues that remain on the skin. Keep in mind that products made from these crops will also contain the pesticide residues, so if you buy any pre-made product containing that fruit or vegetable, you will want to buy organic as well. This is especially true for the products kids so enjoy such as juices and jellies. Lastly, if you enjoy grapes or grape products, there is an added concern: grape growers in the US use a fluoride-based spray and grape juices, jellies and yes, even California wines, were found to have excessive fluoride contaminant levels. Fluoride may be fine on top of your teeth but is not meant to be ingested (just read the warning on young kids’ toothpaste boxes). Because many of us already consume excessive amounts through our water supply if you don’t have a water filter on all your faucets, this is something we really need to try to avoid. So look for organic versions of these products whenever possible. (European wine makers do not use this fluoride-based spray and so do not have the same concern). Getting the right info on buying the best fruits and vegetables is as important as ever, so I want to answer some of the questions people ask me regularly about making healthy fruit and vegetable choices, such as: when is it worth splurging on organic if my budget is tight? Is frozen better than canned? Do I need to wash everything, even if it has a skin? And, how do I decide between local and organic? I’m going to begin by telling you which fruits and vegetables are the safest, and which are the most pesticide-ridden, so that you can start making better choices immediately. Several years ago, Consumer Reports magazine assessed the pesticide residue levels in fruits and vegetables based on data from the USDA, with foods prepared as they would be in a typical home. The score was a composite that was based on how many samples contained pesticides, the average amount and the toxicity of the particular pesticides that were found. In this report, a result over 100 indicated cause for concern. Peaches domestically grown in North America came in at 4,848. Winter squash (domestically grown) came in at 1,706. Domestic apples landed at 550. Domestic pears, spinach, grapes, celery, green beans, grapes from Chile and spinach from Mexico all fell in the 250-450 range. With anything over 100 being cause for concern, this study illustrates why people are so worried about pesticides in our produce supply and why it is worth spending more for organic. Organic foods will rarely be completely pesticide-free; they still have some trace levels of pesticides due to contaminants that remain in the soil or are airborne. However, studies have shown that people who consume conventional fruits and vegetables have pesticide residues in their urine and those who consume organic fruits and vegetables do not. In today’s economy, money can be tight and we are all looking to stretch wherever we can; but spending a little more to buy organic can be a wise investment in your health. If you cannot afford to buy everything organic, but you still want to make some healthier food choices, here are the 12 fruits and vegetables that are worth splurging for organic. According to the Environmental Working Group, these fruits and vegetables contain between 47-67 pesticides per serving (which cannot be washed away). We can handle a little bit of pesticides from time to time, but if you are eating other foods that contain toxins or consuming a lot of fructose or drinking a lot of alcohol, your liver is already busier than it should be and it isn’t fully available to detoxify your chemical load. If you eat from this group regularly, over time you will add significantly to your toxic load; you need to consider not only the effect of these foods, but also the effect of these foods in conjunction with the other things you are eating and doing (or not doing). Children, pregnant women and those with compromised immune systems need to be especially vigilant. It’s estimated you can avoid as much as 80% of your pesticide exposure by choosing organic forms of these fruits and vegetables. It may not be that helpful to assess the rest of the fruits and vegetables because your primary focus should be on avoiding non-organic forms of the produce above. But it often surprises people to know some of the cleanest, least pesticide-ridden produce. While we might like to eat only organic fruits and vegetables because they are healthier and often they taste better, if you are watching your pennies, there is no reason to splurge on organic forms of these. It’s important to note that pesticide residue levels are measured after produce is washed and peeled. So no matter what you are buying, even the clean 15, you should clean your produce with a good veggie wash. You can find citrus-based veggie washes in your grocery produce aisle: water is not usually enough. I wash everything that comes into my house, even if it says it has already been washed. And peeling soft skinned fruits will help reduce pesticide levels as well. 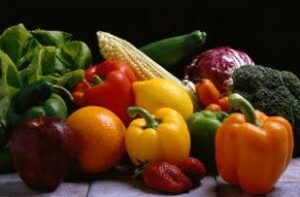 The fruits and vegetables that do not appear on either list are just that: not the best, but not the worst. You’ll want to weigh the conventional versus organic options in light of what else you eat and your financial considerations. If you opt to buy conventional instead of organic, always look to buy produce that is as local as possible. If not at a farmer’s market, your local supermarket often has some produce from regional farms and that is always a better choice than food from far away. In addition to the above lists, you also need to be a wise consumer and read produce signs and labels carefully when purchasing fruits and vegetables. Food stores such as Whole Foods and Trader Joe’s have both conventional and organic options, just as your local market may, so you have to be careful about what you are buying: conventional produce from Whole Foods or your local natural foods store is no better than what’s in your local market, and it may be much more expensive. Some large chain supermarkets (such as Hannaford here in New England) have a wide selection of organic produce that is often cheaper than specialty stores like Whole Foods. Regardless of where you buy, it’s worth reading food labels, as they will tell you the truth. Conventional produce (grown with herbicides, fungicides, insecticides and fertilizers) will have a sticker that has a four-digit number that begins with a 4. For example, a conventional grown banana might read 4011. Because 4 digit codes have now been used up, you will begin to see stickers will four digit codes beginning with the number 3 that are also conventionally grown. Organic produce has a five-digit code that starts with the number 9. For example, organically grown bananas might read 94011. So anytime you are looking to buy organic, just check to make sure the sticker starts with a 9. Supermarket produce sections can be misleading, so double check to make sure you are buying what you really want.